If you were one of the half-million pioneers that went west, you likely would have passed through Wyoming. The Oregon, Californian, Mormon, and Pony Express trails all cross the state. Lots of people moved through, but chances are you’ve never met someone from Wyoming. There are about 585,500 people. In the entire state. The least of all 50 states. But we see a lot of visitors. With the first official national park, Yellowstone, and the first national monument, Devil’s Tower, people love to explore Wyoming. In 2016, Wyoming welcomed 8.6 million overnight visitors. Travel and hospitality is the 2nd industry in Wyoming. Mining (coal, gas and oil) is #1. If you’re headed to Jackson, check out my post. Get more trip planning at Travel Wyoming. With latitude 42.86 and longitude 106.31, high probability of clear skies and an elevation of more than 5,000 feet, Casper, Wyoming was one of the best sites in the United States to view the August 21, 2017 total eclipse of the sun at 11:42 am. Many hotels are sold out for the event and the airport is also nearing capacity. The Casper Star Tribune reported that a cohort of Saudi Arabians are buying a few hours at the Casper/Natrona County International Airport during the eclipse. A local restaurant will cater the tarmac so the Saudis don’t even need to leave the airport. 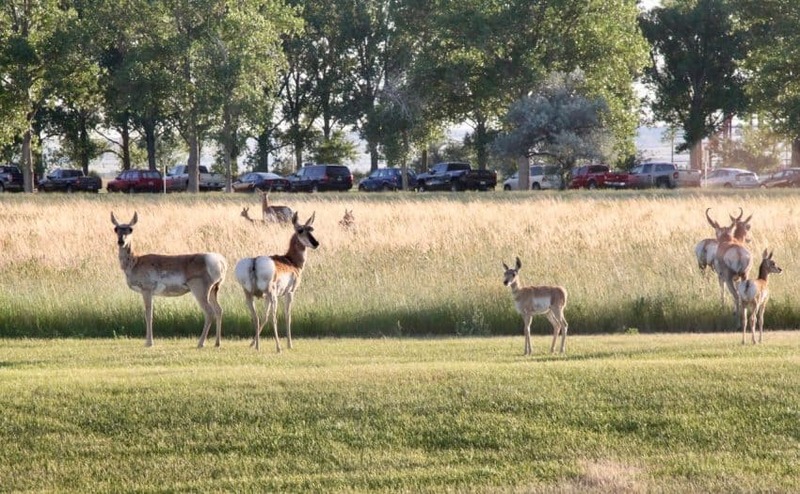 Too bad, they’ll miss the Pronghorn Antelope herd that frequents the entrance. Like many travelers, the eclipse moves on. It will only last 2 1/2 minutes, leaving lots of time to explore. These Casper things help me LiveBest! Wyoming sunsets are remarkable. Red, pink, yellow…the spectacular sunsets are hard to beat. The dry, clean air and thin clouds help make the scene-stealers worth pulling up a chair to enjoy. Like me, many people plan their day around them. Low humidity is one reason the sunsets shine. You may like feeling dry rather than clammy, but your lips will beg for chap stick and your skin for lotion. You’ll also want to stay hydrated, sip more water than you normally do. 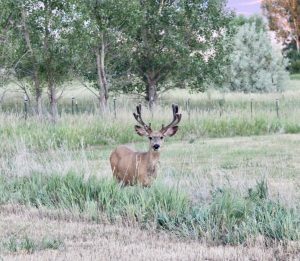 Wyoming is where the deer and the antelope play…wildlife is everywhere! Though a bison decorates the state flag, Pronghorn Antelope are more abundant. Wyoming sustains more than half the pronghorn in the world. 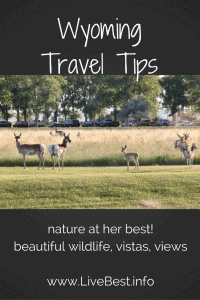 Between the antelope, deer, elk, eagles, turkey, and bison, you will see wildlife. You have to play through them on many gold courses. Explore the outdoors. 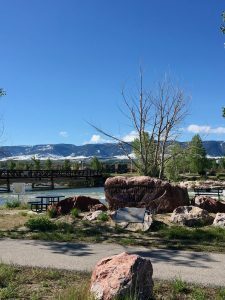 Drive up Casper Mountain, float or fish the North Platte River (named the #1 Big Fish Destination by American Angler Magazine, Casper is widely considered to be Wyoming’s top fishing spot by anglers around the world), or run, walk or bike the Platte River Trails. Explore history at the National Historic Trails Center or Fort Caspar. There are several screens in Casper to watch a movie, but the charm of the Rialto Theater is cool. If you like art, visit Art 321 and Nicolaysen Art Museum. When it’s time to eat you may thank your lucky stars that you weren’t a pioneer! The women on the Oregon Trail did the domestic chores. Ordinary work meant cooking over campfire in wind and rain, using weeds or buffalo chips for fuel when wood was not available. The women searched for wild berries and managed to roll some dough on a wagon seat and bake a pie over hot rocks to lift meals out of the tedium of beans and coffee. They unpacked cooking utensils and ingredients, only to load them the next morning. Much easier to go to dinner at Silver Fox Restaurant and FireRock. or Eggington’s for breakfast or lunch. Grant Street Grocery is a neighborhood shop for your picnic cheeses, sandwiches and food to go. Flour Bin Bakery will satisfy your sweet tooth. Pour House is my favorite coffee shop. Backwards Distillery features locally made spirits with a tasting room. At a mile high, the elevation means it may take you a couple of days to acclimate. At 5,280 feet your red blood cells aren’t carrying as much oxygen and there is less oxygen in the air, so feeling short of breath, tired or headachy is normal for those from lower elevations. Most people will adapt easily in a day or two but those with heart and lung concerns should take it easy. There is also less atmosphere between you and the sun so your skin will burn more quickly. Think (and use) sunscreen! Take home a souvenir. Wind City Books is a locally owned shop (that also carries my book Your 6-Week Guide to LiveBest. Lou Taubert’s has been a favorite stop for western wear and gifts since 1919. 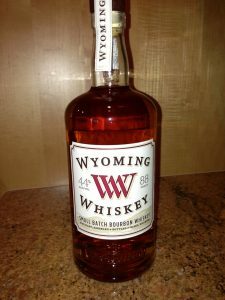 Wyoming Whiskey is small-batch whiskey distilled in the state from regional ingredients. It makes a great Old-Fashioned! With the Rocky Mountains and Great Plains, Wyoming has unparalleled vistas, views and things to see and do. I sincerely hope you enjoy them. In the meantime, meet (and watch) the local herd! Click on the link below. Happy Trails! 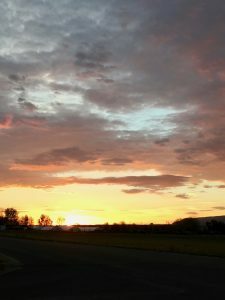 Check out my other travel recommendations here including Jackson Hole. Let me know what you like to do in Wyoming. P.S. Want more tips and recipes? Sign up for my newsletter right here. Now I want to take my vacation in Wyoming! I know you’ve been here before! Also, hiking the Bridle Trail across the face of Casper Mountain, shooting archery at our wonderful outdoor range, the labyrinth alongside the river, and artifact hunting (and all of the above are free!) and in winter – snowshoeing and x-country skiing (we even have a lighted course for nighttime). And those are just suggestions for two of our four seasons – with more than 200 days of sunshine per year there are too many reasons to leave home.